Aisha Buhari visits victims of building collapse in Lagos on Saturday. Source: Bashir Ahmad. 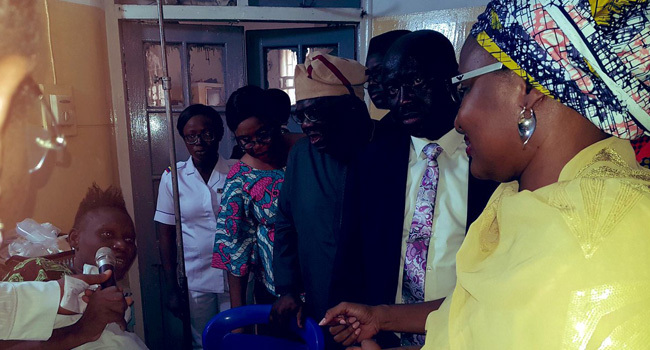 The wife of the President, Mrs Aisha Buhari, on Saturday visited victims of the Ita Faji building collapse at the Lagos Island General Hospital. Her visit was confirmed by the Personal Assistant to President Buhari on New Media, Bashir Ahmad. During the visit, Mrs Buhari prayed to God to grant families who lost loved ones the fortitude to bear the loss, while also wishing the survivors speedy recovery. The three-storey building located on Marcey Street of the Ita Faji area of Lagos caved in on Wednesday around 9:45 am. At least 24 victims, mostly children who were pupils of a primary school located on the top floor of the building, were, however, rescued from the rubbles. Nine persons were confirmed dead as the rescue officials declared the operations concluded on Thursday. Barely 48 hours after, a similar incident occurred in Oyo State, although all eight of the victims were rescued.